I haven't heard officially whether the questline where Thrall visits Nagrand will be removed by Cataclysm, but it seems like an unfortunate but safe bet. Garrosh Hellscream will sit in Thrall's chair in Ogrimmar, making it difficult to keep an old storyline about how the player enlisted Thrall's help to talk Garrosh into attempting to make himself useful. Assuming that it is gone, this story is possibly the biggest loss that Deathwing will inflict on Azeroth. In terms of poorly designed quest structure, this quest is right up there with LOTRO's notorious Tomb of Elendil quest. First, the player must complete all of the solo quests in Garadar, along with a handful of non-instanced quests for small groups of level 68 players in the western end of the zone. (Good luck finding a group for these, as level 68 players will receive far superior loot by going to Northrend instead of sticking around Outland.) This opens up a few more solo quests, followed by a visit to the 5-man Auchenai Crypts. The Crypts are tuned for levels 65-67, though I guess that the original intent might have been that some players would run the dungeon as a level 70 heroic. The good news here is that the random dungeon-finder ensures that there will be players willing to fill out your dungeon group in exchange for random rewards. In short, finishing this questline at the apporpriate level in an out-dated expansion would not be fun for anyone who does not have a static group of some sort helping them out. Fortunately for my hopes of ever seeing the end of this story, WoW has had far more gear inflation than LOTRO over the last three years. I was able to solo all of the non-instanced steps up to the Crypts run at level 78, but the final boss of the Crypts was a bit too much. Two levels and a bunch of gear upgrades later, the dungeon was relatively easy to solo. The final step was obviously very easy to solo at this excessive level, but it would have been hugely frustrating had I been working on this quest at level 68. As an Alliance player, I had been aware that this storyline would ultimately bring Thrall to Outland in order to tell the tale of the redemption of Grom Hellscream to his despondent son, Garrosh. As thanks, the younger Hellscream has gone on to become the annoying sidekick of the expansion, and there are people who would rather follow the famous corpse of Mankrik's wife than Garrosh as the Horde's new Warchief. What I did not know was that there was something else in the story for Thrall. 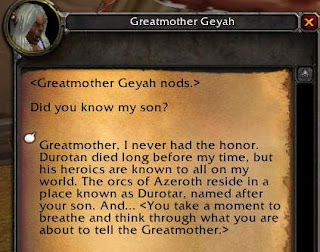 Upon completing all of the quests and failing to get Garrosh up off his rear end, the Mag'har Greatmother laments the absense of her son, Durotan. 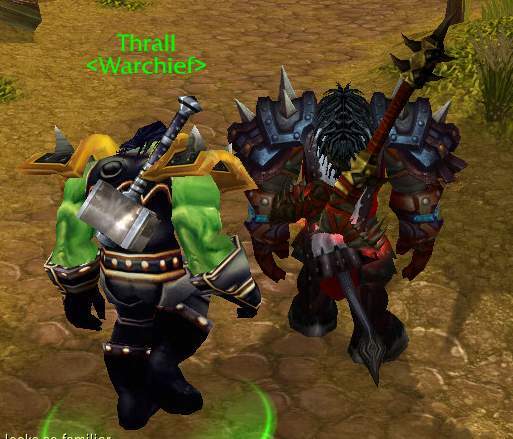 This name is meant to ring a bell - by the end of Warcraft III, Thrall has named the new Horde's homeland Durotar, after his late father. By doing what we normally do as adventurers, slaughtering our way across the zone, us players have inadvertently reunited the Warchief with his grandmother. Players have some close brushes with the lore in various places in WoW. The Alliance has the now mostly removed storyline of the "missing diplomat" and Onyxia's stint as Lady Katrina Prestor in the very throne room of Stormwind. In Northrend, the Alliance reunites Muradin Bronzebeard with his brother. Horde players can hear a haunting melody by returning a keepsake to Lady Sylvanas. Both sides experience the battles of the Wrathgate and the Undercity (the latter of which will be gone in Cataclysm). In these dramatic moments, though, it feels like the player serves in a supporting role to the real protagonists. We may provide crucial intelligence and support, but the final battle is fought under the banners of Bolvar Fordragon or Thrall or some other more significant character, with the player serving as a mere footsolier. Though it is ultimately Thrall that returns Garrosh's resolve, this story succeeds in making the player feel that it was our actions that led the Warchief to return home. Getting this story done before the increasingly imminent Cataclysm was my highest in-game priority in MMO's, and the payoff turns out to have been well worth it. If you have never seen the tale and you have a character anywhere near the appropriate level on the Horde side, I'd advise you to do what it takes to see this story unfold before it's too late. On the left, the legendary Doomhammer, weapon of prophecy. On the right, a hammer I picked up off of a random Flesh Giant who forges weapons for the Lich King's grunts in the Pit of Saron. Fill in your favorite joke about players and/or item designers overcompensating here. Wow, good point. I never really did consider how WoW in its attempt to deliver some of its immense amounts of lore - lose the player when doing so. Of course the players should feel important and be the focal point of the story, but I guess that is difficult considering the developed-through "famous" characters from the Warcraft games and books. A shame to see one of the good quests go. Great post! I can understand the feeling, however, my larger (some loosely relevant) gripe with Nagrand is the fact that the Horde get this particular immersive and long quest line, with heavy lore and a foreshadowing of things to come in Wrath and Cataclysm. What do the Alliance get? Dallanna: The quest load isn't completely balanced between Horde and Alliance. Horde might get the Nagrand questline, but Alliance quests some pretty important questlines in Northrend. i don't really agree with the supposed difficulty of this quest line. there's definitely a lot to it, but as i've always leveled in nagrand it's just something i do automatically. i did it my first time leveling back in BC (yes, before hitting max level), and i did it recently as i leveled a death knight. even the crypts part is pretty easy, thanks to the dungeon finder. The questline isn't going to be taken out. Period. In WoW, there are plenty of characters who exist in two or even three places at once. The fact that Garrosh becomes warchief in Cataclysm does not cancel out his younger whiny self in Nagrand, or even the budding jerkface we saw at the Argent Tournament. Take this example...in cannon Illidan is dead. We killed him, but if you revisit Outland the quests there act as if he's still alive. Because he is...in the past...BC is in the past. This is also how Old Blanchey exists in both Westfall and the Westfall Brigade Camp in Grizzly Hills. Same horse, but WotLK is in the current-day and vanilla is in the past. It's confusing to say the least, but Blizzard simply can't afford to go back and rework all the quests after we finish off major baddie or certain characters, like Garrosh, progress forward. @Dallanna: The Alliance have had plenty of actual lore in their own right. Please see Warcraft through Warcraft III for details. Let the Greens get a few tasty lore bits for once.